I love this story…against all odds…creativity won out! If there were Richter scale to measure joie de vivre, John Lowe’s rating would surely be off the charts. A former teacher and theater director, father of four and grandfather of 11, he took up ballet at 80, exercising between classes on a homemade trapeze he rigged up at home. It seems to have kept him engaged, body and soul. Lowe’s hopeful spirit may not be expected from someone who survived his hardships. Back in 1945, he was a prisoner of war who endured three and half years of starvation in Japanese prison camps where he worked as a dynamiter in a coal mine, he says. After the war, he made his way back to England, got a grant to study art in London and by 1951 earned a diploma and found love with a fellow student who he called “the love of his life.” Three daughters and a son followed, and it was actually thanks to one of his daughters that his love of dance was born. 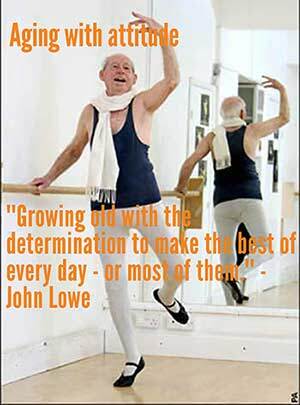 Lowe, who studies with the Lantern Dance Theatre Company, had his first starring role in a ballet at the age of 88 when he performed a routine with dancers more than half his age at the Ely Cathedral in Ely, Cambridgeshire. John Lowe runs no risk of going unnoticed or unused. He talked to us about the art of survival and the joy of dance from his home near Ely, an old cathedral town near Cambridge in England. How old are you now, and how do you feel? In August I shall be 95 – for most of the time I feel well, and much of the time perhaps as well as I did 30 years ago. I believe it has something to do with the fact that during World War II I lost six of the best years of my life and I’ve been trying to catch up ever since. In 1965 I became director manager of the small Strode Theatre in Street, Somerset. My daughter Alison auditioned for, and was accepted at the Arts Educational Trust Theatre School as a ballet boarder at the age of 10 and this, together with my new job, really sparked my interest in ballet. All sorts of groups came to perform at the Strode Theatre – musicians, orchestras, drama groups – and then, regularly, companies from the Royal Ballet Company. I would stand in the wings and sketch, thinking, “How I wish I could dance like that!” Thirty years on, in my 80th year, I went to my first ballet class, in Ely – and now, in my 95th year, I continue to go to classes. What do you most love about dancing? I am a pianist with an acute sense of rhythm. It is a joy to move to beautiful music. But the really important thing for me is that I am working with much younger people who treat me not as an old man – which I most certainly am – but as a friend. How does it feel to perform publicly at this stage in your life? Many years ago – from 1965 to 1974 – when I directed/managed the Strode Theatre, I acted myself and produced lots of plays, revues and shows of various kinds. I’m no stranger to performing. You are a war vet. How did that change you? What was the biggest lesson you learned from that experience? It taught me to survive – and on return to the UK from Japan’s prison camps at the age of 26, I used to get very angry at what I thought was the unfairness of treatment towards returning POWs. I learned that if I was determined enough, perhaps I could do anything – hence my application and acceptance at Art College. What is the best thing about getting old? The love and devotion of my children and grandchildren; I delight in their intelligent and musical company. What do you know now that you wish you had known at 30? That my mother was a saint – with every year that passes I realize just how much she did for us, gave to us: From the age of 27 to 32 I was so intent on catching up on the six years of war time, and getting married, that I took all her efforts too much for granted. My sister, now 93 agrees with me. I’ve never heard the term. But I suppose it’s growing old with the determination to make the best of every day, or most of them. John Lowe no longer performs with Lantern Dance Theatre Co, but he still takes classes. For his 90th birthday, the company gave him the starring role in this ballet set to Johann Strauss II’s “Artist’s Life. ” The piece was performed at Ely Cathedral; choreography is by Helen Pettit.